Some horse owners, when they’re building a wooden corral or erecting a pipe corral, don’t include feeders. Their reasoning is that in the wild, horses eat grass—and they eat it at ground level. Feeders are usually placed so the horse has to lower his head in order to eat, but not at ground level. (For good reason. Feeders usually have three upright metal bars to hold the flake of hay and keep it more or less intact while your horse yanks chunks of it out to eat on the ground. You don’t want your horse to wedge a hoof between the bars.) But many of these owners make a costly mistake when they decide not to put down rubber mats, either. Horse owners who want the best for their horse will include a feeder, and will also place enough mats (four in a 24’ x 24’ pipe corral) so the area underneath the feeder is covered. Why is not having rubber mats under the horse’s feeder a costly mistake? Two words: sand colic. And sometimes even rubber mats aren’t enough. Sand colic is the result of an impaction, in this case a buildup of sand in your horse’s gut that he ate along with his hay. It’s especially common among horses fed alfalfa, because the leaves and tiny lavender flowers are very brittle and fall off the stems if he so much as breaths hard while he eats. Because they’re much tastier than alfalfa stems, horses spend hours trying to lip up the good parts. In other words, this kind of colic is not due to gas, and if left untreated, the impaction can kill your horse. If you’re wondering if your horse is carrying sand around in his gut, pick up two or three recent droppings. (Slide a sturdy plastic bag with a fastening on the top inside-out over your hand. Then reverse it so the droppings are inside the bag and your hand is outside.) Add enough water to cover the droppings and park the bag on a flat surface for 24 hours. Then examine it. If you see that sand has sifted out of the manure and is lying on the bottom of the bag, you need to get it out of your horse’s gut. Most products designed to do that contain psyllium and work the same way Metamucil does for humans. 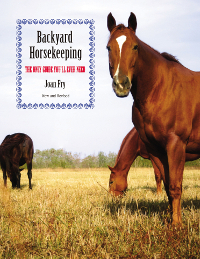 Life will be safer for your horse if he doesn’t have to eat off bare ground. And life will be a lot more pleasant if he doesn’t have to lie down on it, either. Packed dirt is as hard as concrete—it’s just not as abrasive. But your horse can still rub sores, usually on the outside of his hocks and sometimes his knees, from lying on hard ground. Ground that’s as dry and hard as we have in the high desert is almost guaranteed to result in grimy, smelly pasterns and fetlocks because your horse splashes himself whenever he urinates. And since horses tend to have particular pee spots and use them again and again, there will always be a smelly wet spot in their pipe corral. If your horse happens to come in contact with it when he lies down, his entire body will look and smell the way his pasterns do. Be prepared to give him a bath once a week. Otherwise the stink will draw flies, and your horse will be miserable. Is that what you want for your horse? A life of misery? That puts you in a minority, since most owners want to give their horses a good life. What this means in practical terms is that you install a feeder (it can also hold salt bricks and mashes), buy rubber mats (not the smooth kind—they’re slippery), provide shavings for him, and clean his corral on a regular basis. But sometimes even shavings over a rubber mat aren’t enough to keep your horse from eating sand with his hay. I may have mentioned that Gunsmoke, my rescue horse and a five-year-old stallion when I got him, paws when he’s impatient or irritated. He’s learning to curtail his impatience when the shoer is working on him. But if, in his opinion, the person who feeds him hasn’t shown up on time, he paws. He does not paw on the mats. He paws on the dirt behind the mats. I didn’t realize this until one day when I had added three bags of new shavings to his corral. I was using a rake to spread them out when I raked a bald spot on the mat and discovered—dirt. Was he trying to give himself sand colic? Of course not. He was just being a horse. But I realized that he could get sand colic even with mats. Now, I rake all the old shavings off the mats and sweep off the dirt that was under the shavings with a broom. Then I add shavings. I use slow feeder hay nets ($6/8) hung from 2 snaps at apposing sides ( east and west) to give one foot of ground clearance as they empty(so as to not be caught in shoes) over a rubber mat (4by6). Also snap the net with snaps to screw eyes in a 30by30inch wooden box on a rubber mat as a secondary method. These nets can hold 20 lbs of hay and last a day . Also nets that hold a whole bale can be secured in a stall. Thanks for writing. You’re right about the slow feeder hay nets,and I couldn’t agree with you more. We have taken so much away from horses, such as their ability to move from freely from one place to another. 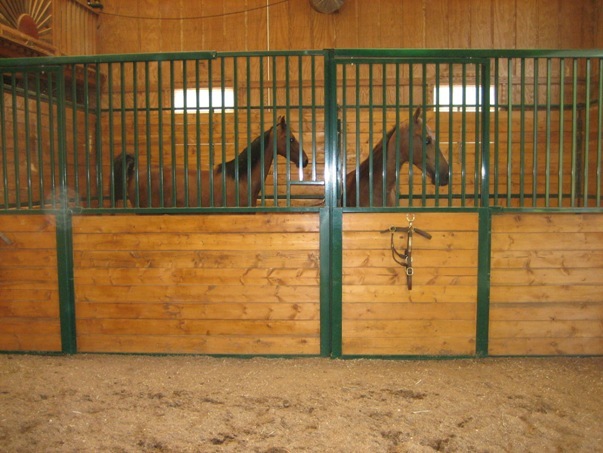 We limit the size of our stalls or pipe corrals, and think that a round pen is enough of a turnout for them. It’s not. But since most of us have done exactly that, I try to repay my horses by giving them something they also value: the ability to keep their gut full all day long (which they do naturally in the wild) without getting fat. You can do that by using hay nets. The only point I disagree with you about is raising the net. 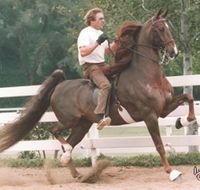 If you only raise it a foot off the ground, it’s still easy enough for a horse, especially one shod in front, to snag a foot–or a shoe–in the net. Raise it higher. Thanks again!